You may be hearing about this on the news this week. There will be a new way that Google Search ranking for mobile-friendly devices occurs. Websites that are not mobile-friendly will be dropped from Google Search, whether you are on a mobile device or not. On Apr. 21st, the Google Search algorithm is changing again. Have you heard about their Penguin or Panda updates of the past? This update promises to be bigger. Google search plans to completely de-index websites that are not mobile-friendly. You can read more about it here. Mobilegeddon? I like it. Just a note to those of you that have sites built and managed by Social Energizer. I wanted you to know, that in the past few weeks, I have personally checked all the sites that I am responsible for. I have found them all to pass the mobile-friendly test using your Google Webmaster tools accounts. It made me feel good, that because they are all designed ‘responsively’, they passed with flying colors. 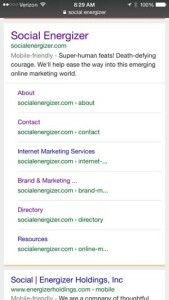 An easy way to check it out yourself is to go to any smart phone and enter organic parameters for finding your website. In other words, use keywords, not the url, for finding your site on your phone. When it appears in the search screen, it will say Mobile-friendly in the prefix of the description, like I’ve shown below. That’s it… way easy. This is one more reason, why I say that WordPress websites work best for small business. The WordPress platform that structures your website is a continuously updating web platform. They saw the need to be mobile-friendly long ago, that trend started about the time the first smartphone sold. As we track the mandates from Google and other dynamic variables (i.e. security) on a daily basis. You can rest easy knowing our proactive strategy positions your website for any upcoming trends. Keeping your web traffic safe and flourishing is important to us. Thank you for letting us serve you.